University College of Syracuse University was one of a dozen companies and organizations in Syracuse to participate in the Corporate Volunteer Council’s annual dictionary day. 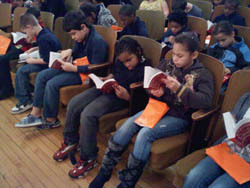 Every third grade student in the Syracuse City School district received a dictionary as part of the annual initiative. Eileen Jevis, manager of public relations at University College traveled to Delaware School and distributed 80 dictionaries to the third grade class. The students also received goodie bags containing bookmarks, puzzles, pencils and stickers. During the program, Jevis asked the students to look up several words to help them to practice using the reference guide. Those students who found the word first were asked to stand and read the definition of “integrity” and other words. The Corporate Volunteer Council of Central New York (CVC) is a coalition of businesses, organizations and associations that recognize the importance of volunteerism in our community. For more information about the CVC, visit www.cvc-cny.org/.